Part of my Mothers’ Day present was moving some landscaping stones. Each one had to be placed in the wheelbarrel and then back down in another area. I was concerned that I may strain my back, so I took special care to bend my knees, keep my back in neutral and use my glut and leg muscles to power up. It was a fabulous workout. Sure my legs and lower back muscles felt like they had been asked to do more than they were accustomed to, but what I had failed to consider was the 140+ bicep curls that I also did. Those babies cried for 3 days. I credit Zumba for the lack of soreness in my legs that I had expected. I am now motivated to work more on my upper body! This morning I awoke motivated and ready to roll. 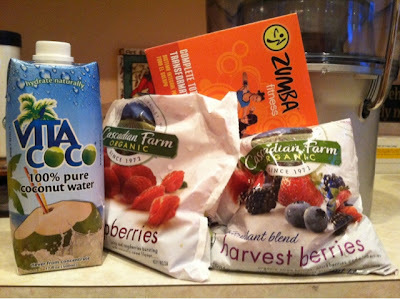 After a little Zumba, I set to juicing up some berries. This is the second time that I have used this mix and it is a nice break from the veg mixes. After dipping my toes in the water, I think I am ready to start juicing more often. Tomorrow I have a mix of swiss chard, kale, spinach and apples planned. I may throw in 1/2 of a grapefruit that a friend harvested from a neighbors tree.